“If the strike escalates, that would be detrimental to the oil price,” David Lennox, a resource analyst at Fat Prophets in Sydney, told Bloomberg News. “It will put high US production out onto the market and there’s nowhere for it to go,” Lennox said. Just hours before stock trading opened in New York, crude oil prices had recovered most of what they had lost. WTI again neared $50 per barrel and Brent reached $55 a barrel. The US is the world’s biggest oil consumer, but has ramped up production to a point it has created a global oil surplus, which has driven prices down more than 51 percent since last year. Record high production by OPEC countries, as well as Russia, are also contributing to the oversupply. 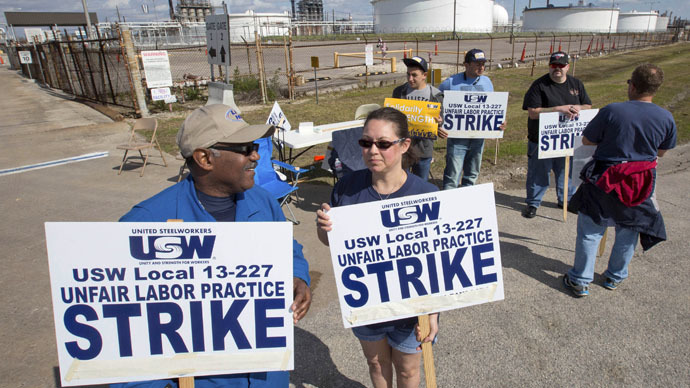 The walkout of refinery workers – the first since 1980 – took place on Sunday, after the United Steelworkers Union (USW) rejected the fifth offer by the industry’s main negotiator, Royal Dutch Shell Plc, which in turn halted talks. Negotiations, and demonstrations by union members, have been ongoing since December. In 1980 the strikes lasted three months. 3,800 workers at nine sites in Texas, California, Washington, and Kentucky are demanding higher salaries, better healthcare, and more workplace safety guarantees. The ‘work stoppage’, organized by the USW, started at 12:01AM on Sunday. The USW represents 65 facilities refining approximately 64 percent of the oil in the US, and over 230 oil terminals, pipelines, and petrochemical plants in the United States. It is also the largest private sector union in North America, representing 850,000 people working in a spectrum of sectors including metals, mining, energy, and healthcare. The remaining USW refineries are operating under a rolling 24-hour contract extension.